If you’re using Lightroom to manage your photos, you are probably serious about your photographs. […] if you are indeed serious, then practicing good color management is essential. Remarkable series of images by Chris Jordan depicting rates of consumption in America through exhaustive diagrams. Staggering when you see them in close-up. A while back I mentioned that the iPhone App Store was a place where we could see people paying for interface alone, regardless of functionality. This is a useful segue into Daniel Jalkut’s commentary on the nature of independent software development, and, specifically, whether small-software should be free-as-in-beer software. Jalkut makes the point, as an independent developer, that you should support the software you like, regardless of how slight it is. The example he refers to is Pukka, a nice little tool for posting to delicious from OSX. Pukka is nice because it’s always available and it’s very Mac-like in its behaviour. It’s pretty cheap at $12.95. Jalkut takes exception to Leo Laporte’s commentary in a MacBreak Weekly podcast, where he suggests (as he tells us how much he loves Pukka) that it should be free. Why did he suggest this? The answer, simply, is that Pukka is an interface to someone else’s functionality rather than a tool in its own right. To wit: Pukka interfaces to delicious through the delicious API. Most of the hard work of social bookmarking has already been implemented by the delicious time. All Pukka does is talk to the API – it’s a menubar item, an interface, and a window that sends data to the API. Not a product on its own. Of course, if you know anything about development, you’ll know that building things that talk to APIs – on the desktop, on the web, wherever – isn’t always as easy as it sounds. $14.95 seems reasonably to pay for an app that does this well, especially if you use delicious as much as (eg) I do. Jalkut’s own MarsEdit (which I’m using a licensed copy of to write this) is similar. It’s a $29.95 weblog editor, that interfaces with most popular blogs, and lets me write posts on my Mac desktop. It’s not that I couldn’t write blogposts before; I can always log into WordPress to do that. No, the reason I bought this is because of the convenience and quality. I rather like posting from this fluid, offline interface, rather than having to type into a box in Safari, for various reasons – the quality and speed of preview, the simplicity of media integration, and the multi-blog (and API) support – I use MarsEdit to post to both WordPress and LiveJournal. If I couldn’t spare $30, I could always just blog from the existing admin screens, but I felt the product was so good I should be it. Sometimes, it’s hard to express to people the value of a product that does something you could already do. A product that does something new, or which is an essential tool, is much easier to justify. Many Mac owners I know didn’t hesitate to pay the €39 for TextMate, because text editing is so fundamental to our work. But $30 on a blogposting client? That one requires more thought, and isn’t such a no-brainer. I’m not sure what the solution is. It’s a shame that it’s harder to express the value of “service” applications; I think the iPhone might have it better off here, simply because the device itself is so unlike traditional clients that it makes sense to redesign interfaces to services for it. In the meantime, it’s worth remembering that a quality interface to an existing product might still be worth something, however small, and it’s for that reason that developers like Jalkut should be rewarded for their work. “When you find new information, you get an opioid hit, and we are junkies for those. You might call us ‘infovores. '” … We are programmed for scarcity and can’t dial back when something is abundant.” So that explains it. 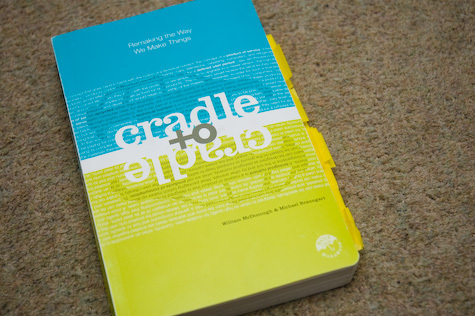 Any way you look at it, William McDonough and Michael Braungart’s Cradle to Cradle is an unusual book. Cradle to Cradle is not made out of paper, you see. It’s a format called Durabook. The Durabook is made of a kind of plastic, and is entirely waterproof. More interestingly, it’s entirely reusable – the ink can be easily removed to allow reprinting or notebook use, and the “paper” itself can be melted down and reused without giving off toxins. It’s a good environmental citizen, essentially: reusable, up-cyclable, and with no harmful byproducts. (It’s also surprisingly heavy for such a slim format). I found it an interesting read. I found a lot of their later commentary on designing services probably the most interesting and relevant – a lot of discussion on refactoring products (which, by their nature, are designed for disposal) into services (wherein the product can be upcycled or removed from the equation, as it’s the service that matters). The Linc concept mobile phone is a good illustration of the thinking the book suggests. At times, though, I found it depressing; a lot of the innovations pointed to are McDonough and Braungart’s own, and it would have been good to see more examples from people other than them. Similarly, at times the scale of the challenges described in the book seems colossal, and perhaps impossible. I really enjoyed the section on Ford. They point out that a lot of Ford’s innovations really were more environmentally-friendly than the wasteful, inefficient factories that had preceded them. This doesn’t make it good, per se, but it’s worth bearing in mind. And I love “cars cannot buy cars”. But to be less bad is to accept things as they are, to believe that poorly designed, dishonorable, destructive systems are the best humans can do. This is the ultimate failure of the ‘be less bad’ approach: a failure of the imagination. From our perspective, this is a depressing vision of our species’ role in the world. It takes them a while to get to that point (in a ~180 page book), but that’s the real kicking-off point for the more interesting arguments – by reframing the problem in a world that doesn’t have a concept of waste, what kind of answers emerge? True “services” have to intend to service a particular need – you can’t just apply the s-word to any available substrate or process. That would make Sim City interesting. p.88; professor Kai Lee talks to members of the Yakima Indian Nation about the long-term plans for storing nuclear waste within their territory. “The Yakima were surprised – even amused – at Kai’s concern of their descendants’ safety. ‘Don’t worry,’ they assured him. ‘We’ll tell them where it is.’ As Kai pointed out to us, ‘their conception of themselves and their place was not historical, as mine was, but eternal. This would always be their land. They would warn others not to mess with the wastes we’d left. This reminds of Tom Coates’ Native to a Web of Data – we will become native to the web when we recognise that the data structures we create and impose on it will stick around forever, and that we should design them as such. And that’s all, really. I enjoyed it a lot – though I found its message difficult and overfacing at times, and the perspective perhaps a little smug, there was lots of good stuff in it and it provided food for thought. Thanks to Tom for letting me borrow it, and to Mike for the format this blogpost takes. “a superhero’s costume is constructed not of fabric, foam rubber, or adamantium but of halftone dots, Pantone color values, inked containment lines, and all the cartoonist’s sleight of hand.” Michael Chabon on the escapism of costume. “Rajesh [Thind] investigates the way we view the lens and the way it views us.” Gosh, this made me very uncomfortable and somewhat angry. Dolores Labs Blog » Blog Archive » Where does “Blue” end and “Red” begin? Andrei Herasimchuk posted this to the IxDA mailing list, as part of a (reasonably interesting, given the usual turgdity of the list) discussion. The quotation itself was just too good not to lift. Too much emphasis cannot be placed on the importance of three- dimensional models. We come to this step after we have analyzed and evaluated hundreds of designs and blueprints, trying to bring some quality to the product that will make it easier to use without increasing the cost, more pleasant to look at without any drastic changes in the factory routine. When our ideas have been formulated, we design in clay, then plaster, finally in a material that will simulate the material to be used in manufacturing the actual product. Wherever possible, such models are done in full size. In developing the exterior of a train or a ship, accurate scale models must suffice. The cost of a model is more than compensated for by future savings. It not only presents an accurate picture of the product for the executives, but it also gives the toolmakers and production men an opportunity to criticize and to present manufacturing problems. Models of some products can be made for a few hundred dollars. Full- scale models of ship or train interiors can cost many thousands of dollars. A mock-up of a modern passenger airplane cabin may cost $150,000 but it will be worth it, for it permits engineers and designers to develop techniques of installation that would not be otherwise possible. Furthermore, sales executives can bring potential customers into a faithful, full scale fuselage to see what it offers, long before production begins. It is far more effective to sit in a chair that judge its comfort by a picture of it. Henry Dreyfuss, Designing for People, 61-62. This doesn’t just apply to ships and trains, does it? We’re back to sculpting versus painting again. “I went and wrote Paperclip on the plane to RailsConf last year. We’ve been using it here in various forms since and IMHO it’s *the* way to handle uploads, and finally decided that it should be released.” Another handy Thoughtbot plugin.